Honey is one of nature’s greatest gifts. It is full of enzymes and nutrients to provide a burst of sweet and natural energy. Honey on its own is a nutritional powerhouse, but add in some marijuana and it becomes an elite superfood. There is no better combination than honey and marijuana, and you can use your honey as you normally would, except with some extra medication. It is also incredibly easy to make and will ensure that your THC tastes especially sweet. It is one of the cleverer ways to get some THC into your body, as you can use your marijuana honey on toast, with tea, with porridge or straight from the jar! If you’d like to get culinarily creative or would like to add herbs to compliment your honey, you can add some dried lavender, sage, rosemary, thyme, vanilla, or cinnamon to your decarboxylated cannabis. Remember to select the finest honey that you can find. 1 liter of high quality organic and local honey. Step one, as always, is to decarboxylate your marijuana. This is a very straightforward procedure. Put the marijuana chunks into an oven and bake them for 30 minutes at 225 degrees Fahrenheit. Your marijuana is now decarboxylated. The reason for this is that the THC does not get released unless it is heated, meaning you would be missing out on most of the benefits associated with cannabis. Until THC is heated up it actually remains in the form of THCa. It gets released in the form of THC when heated to a sufficient temperature. Once the marijuana has been decarboxylated, put it into the crockpot and add the liter of honey as well as the bee pollen. It is important to grind the weed up finely when using the crockpot method. Monitor the heat carefully and keep stirring. If it gets too hot it could ruin the entire recipe. Cook for 8 hours at 130 degrees Fahrenheit and stir often. Strain the honey after the 8 hours is up. If you let it cool you won’t be able to strain it until you reheat it. 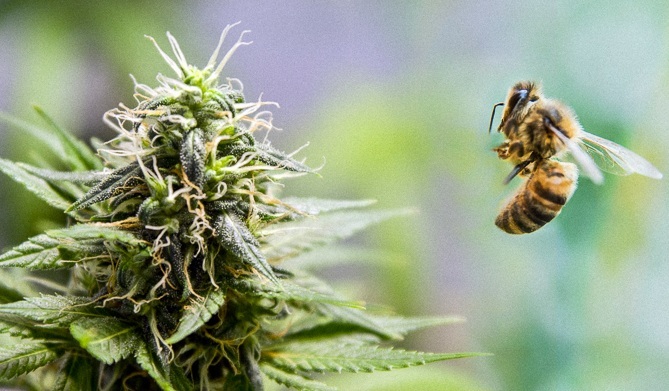 Place the marijuana infused bee honey into a jar for storage. Honey does not really go off, and it is up to you to decide whether or not to freeze, refrigerate or leave at room temperature. A good combination may be to keep some in the fridge while also having some out at room temperature for general use. Whatever you decide, you now have some top-quality cannabis infused honey to spread on all your favorite foods. It is more than a sweet treat, but a medicine and superfood for supreme health and wellbeing.